As Wall Street digs into December and traditional year-end trading, one big question is coming up more and more: "Just how dangerous is an inverted yield curve?" Let's check that out -- and also look at how you should play things for the rest of this month and beyond. Now, many investors are closely watching the yield curve -- the difference between what U.S. Treasury bills, notes and bonds of different maturities are paying - for any signs of a looming U.S. recession. 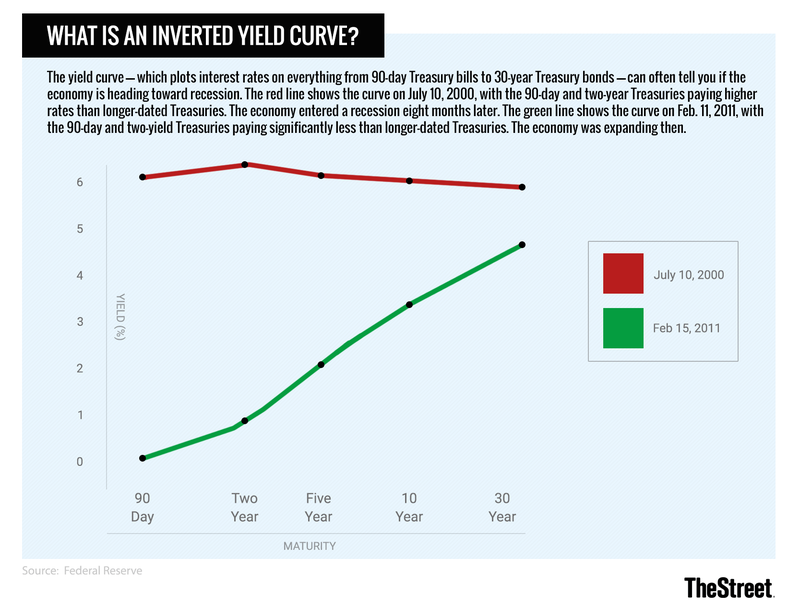 As you probably know, a so-called "inverted" yield curve - where two-year Treasuries yield more than 10-year Treasuries do -- has accurately foretold the past nine recessions. For folks who might not be familiar with this phenomenon, it occurs when the interest rate on a two-year Treasury note exceed what you get on a 10-year Treasury note. This happens because markets don't believe that U.S. economic growth will continue for much more than two years. That's usually bad news for stocks. Now, the spread between the three- and five-year Treasury notes has already inverted, but the all-important spread between two- and 10-year Treasuries keeps going back and forth between roughly 10 and 12 basis points. That's close to an inversion, but not quite there yet. Some say that there will be time to react if the yield curve inverts, but I'm not so sure. In the past, the yield curve's inversion preceded the stock market's top by about eight months on average, with a U.S. recession hitting about half a year later. But keep in mind that humans no longer run markets, computer algorithms do. So, these developments can move much faster than before. Those of us trying to survive the marketplace can still try to play the growth game, but must remember that the odds won't be in our favor forever. For now, the "safety" trade seems to be to stick with bonds and dividend plays like utility stocks. I believe that smart investors should embrace dividend stocks that boast a solid reputation for making quarterly payments. Think oil giant Royal Dutch Shell (RDS.A - Get Report) or utility Southern Co. (SO - Get Report) . You should also favor certain staples like Procter & Gamble (PG - Get Report) (although I don't currently own it), along with high-quality debt and hard assets like real estate or precious metals, although gold is lagging other perceived safe havens. That said I don't find stocks to be terribly overvalued in general, and I still see earnings close enough to peak (if not right there). Yes, regular readers know that my cash levels have been high, and I'll continue to drain cash out of equities on rally days for at least another month. However, I'll remain diversified. It might surprise you to know that I've significantly expanded my long positions in the oil patch. Crazy? Hey, the group is close to its lows, they all pay nice dividends, and the Organization of Petroleum Exporting Countries wants to play ball for now, and. So, I'm long BP (BP - Get Report) , ExxonMobil (XOM - Get Report) , Royal Dutch Shell, Schlumberger (SLB - Get Report) and Valero Energy (VLO - Get Report) . I believe that Macy's (M - Get Report) , Kohl's (KSS - Get Report) , and Target (TGT - Get Report) all offer enough yield to earn a place on my book. I remain long Verizon (VZ - Get Report) , and I'll never be flat Seagate Technology (STX - Get Report) . I can hear you saying: "Oh, Sarge, Seagate is awful," but I really don't care how the firm does because it offers a 6.7% dividend and never misses a payment. That's why STX will be in my dividend portfolio until the cows come home. General Motors (GM - Get Report) is another nice dividend payer, currently yielding 4.3%, GM is pretty stable, and you can't believe how low you can drive a net cost basis down until you do so repeatedly through the sale of both GM puts and calls. Meanwhile, I'm hanging on to KeyCorp (KEY - Get Report) not because it's my favorite bank (it isn't), but because of its 4.5% dividend yield. I could go on and on, but I think by now you get my drift -- buy high-quality dividend payers. Yes, I'm still long several low- or no-dividend names across the cloud-computing, semiconductor, defense, and Big Pharma sectors. But with the exception of pharma names like Abbott Labs (ABT - Get Report) or Pfizer (PFE - Get Report) , these positions are down to tag's ends. Now get out there and fight like you're ticked off! And as always, I remain reachable via e-mail using the link to the left at the top of this column. At the time of publication, Guilfoyle was long ABT, XOM, BP, RDS.A, PFE, SLB, VLO, VZ, STX, GM, KEY, KSS, TGT, M and short calls on BP, GM and M.